Pillar of Fire stands at the site of the old Whitman Walker Clinic at 14th and S Street, Washington DC, from 1987-2008. It pays tribute to the courage, caring and compassion of the handful of healthcare workers who mobilized during the dark early days of the fast-moving HIV/AIDS pandemic to address the needs of many who were affected. According to ancient literature, a pillar of fire by night and a pillar of cloud by day once led a lost people through the desert. 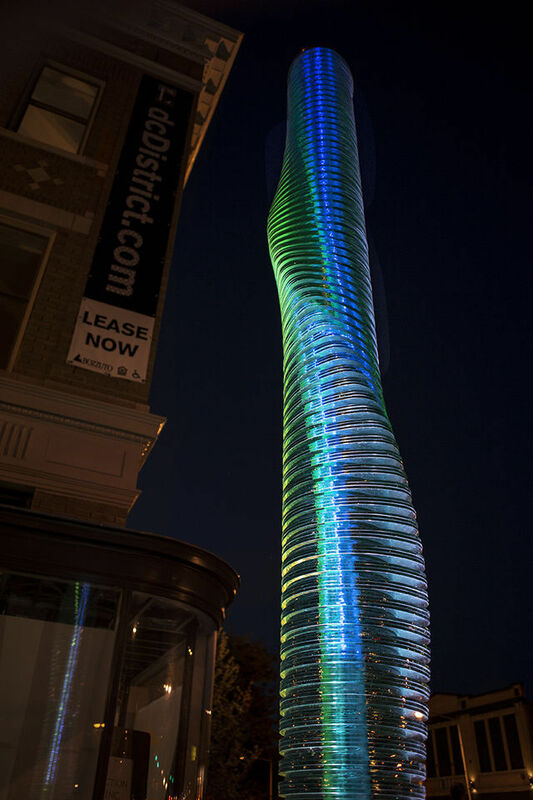 This column of solid glass is comprised of 370 egg-shaped layers of float glass. It weighs 2000 pounds and is rigidly post-tensioned to 15,000 pounds. It responds mercurially to changing atmospheric and lighting conditions by day. At night a slowly-changing display of complementary colors is like an abstraction of the rainbow flag. The courage and selfless service of HIV/AIDS healthcare workers in the face of societal fear and ignorance exemplifies the highest and best within people. The internal and external programmable lighting system was designed and donated by longtime DC-area lighting consultant John Coventry. Engineering services were provided by Eckersley O’Callaghan Structural Design. Stainless steel fabrication was by Tektonics, Inc. Assembly and istallation was by Service Glass of Frederick. Pillar of Fire was sponsored by JBG Companies and Grosvernor Americas.